People love getting tattoos, it has become more common and widely embraced these days, and more people are getting them. They are rich in history and there are varied reasons why people get it. Generally, people get tattooed for their own reasons. The reasons usually change over time. Some people get to honor someone or something or pay tribute to a loved one they have lost. However, after a point of time, they no longer want or wish to get the tattoo removed. Why People wish to seek laser tattoo removal? When a couple have a break up, they don’t want to have constant reminders of their ex-partner. So they want to remove the names inscribed on their body part. Many people wear tattoos to show their spirit towards a particular band or group. However, over the years, their tastes changes and they opt for the removal of tattoos. In many corporate organization, the company feels that their employees should maintain professionalism. However, tattoos shows some extent of unprofessionalism. So just to avoid conflicts and for career prospects, people choose to get rid of the tattoo. Laser removal is one the standard steps adopted for the removal of tattoos. You can learn more about laser tattoo removal in this article. Nobody gets a tattoo with the intention of getting it removed. However, circumstances and situations require them to do so. Gone are the days when tattoo removal was hard and complicated. With the development and advancement of technology and tremendous changes with lasers, it’s now made possible. But at the same time, it’s important that you know how the process works. Tattoo ink is made from chemical compounds made of heavy metals. So getting rid of these compounds doesn’t happen instantaneously. Typically, it takes about four to ten sessions to completely remove the pigment particles. After the end of the session, the tattoo will be completely removed without leaving any mark on the skin. How the Lasers break up the chemical compounds (Tattoo ink)? 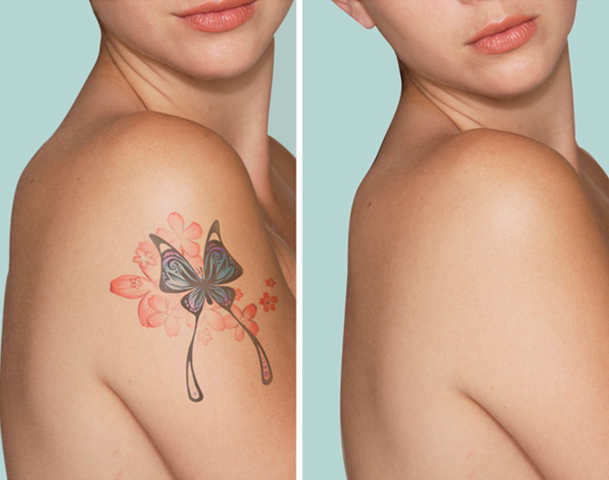 Removal of tattoos basically depends on the color of the tattoo and the ink pigments used. It may vary from person to person and the kind of ink used. Depending on the ink pigments, the laser uses appropriate monochromatic light to match the corresponding wavelength of the tattoo ink pigments. When the laser light hits the chemicals, the energy present in the light vibrates with the particles and breaks them into smaller pieces. On repeated sessions, the pigments eventually breaks and after a while, the tattoo ink completely fades. Though it’s possible to remove a tattoo through laser techniques, the process is quite painful. So before you do anything, learn more about laser tattoo removal and then go ahead with the process.